Each of the unique, brass appliqued wooden boxes are hand-made and lined with red satin to add a regal touch to this “Gift of Kings”. 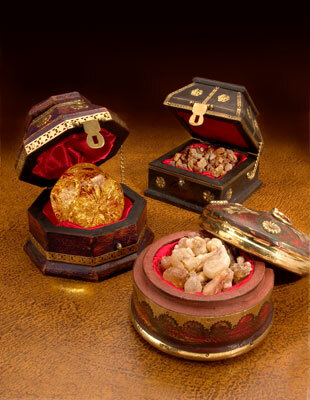 The octagonal Gold box holds a hand-blown glass ball filled with 23 karat gold flakes that float like snowflakes. The ball is specially made so that the multiple curved surfaces reflect and refract the gold and make it dance and sparkle. The gold box measures 4 3/4 x 3 3/4 inches. The round Frankincense box is covered in hand-stamped brass angels and is filled with the finest frankincense from the Dofar region of Oman – an area known as Sheba in Biblical times and said to be the source of the frankincense brought by Balthazar. The base and lid are satin lined and the box measures 4 1/2 x 3 1/4 inches. The square Myrrh box is a satin-lined treasure trove with brass chain and latch (the gold box also has a chain and latch) and holds the finest Arabian myrrh. The box measures 4 1/4 x 3 1/4 inches. Together, the Three Box Set is a beautiful way to begin a new Christmas Tradition. Display your Gold, Frankincense & Myrrh along with your Nativity Set and bring new meaning to our tradition of giving gifts at Christmastime. The set will last a lifetime and will be a gift that is appreciated year after year.